NEW YORK – March 31, 2014 – Syfy’s long-running Emmy-nominated Warehouse 13 will open its doors on Monday, April 14 at 9PM (ET/PT) for the last time as it kicks off the series’ final six episodes. The new season picks up immediately after the events of the last season’s thrilling finale with new caretaker Claudia (Allison Scagliotti) in an epic battle with Paracelsus (guest star Anthony Head) for the soul of the Warehouse. However, their confrontation unleashes an unexpected horror and the Warehouse will never be the same again. In the new season, the entire Warehouse team will confront old questions while encountering new revelations. 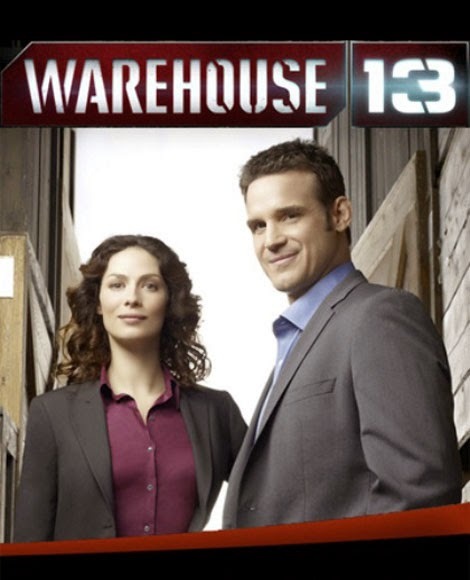 From a painful realization that Pete (Eddie McClintock) and Myka (Joanne Kelly) must face together, to Artie (Saul Rubinek) accompanying Claudia on a soul-searching journey regarding her long-lost sister, and Steve (Aaron Ashmore) colliding with his past, the final six episodes of Warehouse 13 will take viewers on an emotionally-charged roller coaster ride.